I attended a local meeting the other night about a controversial development talking place in Fallowfield, home to a zillion students and a few local residents (including me!) still clinging on to their homes and sanity with the tips of their fingers. 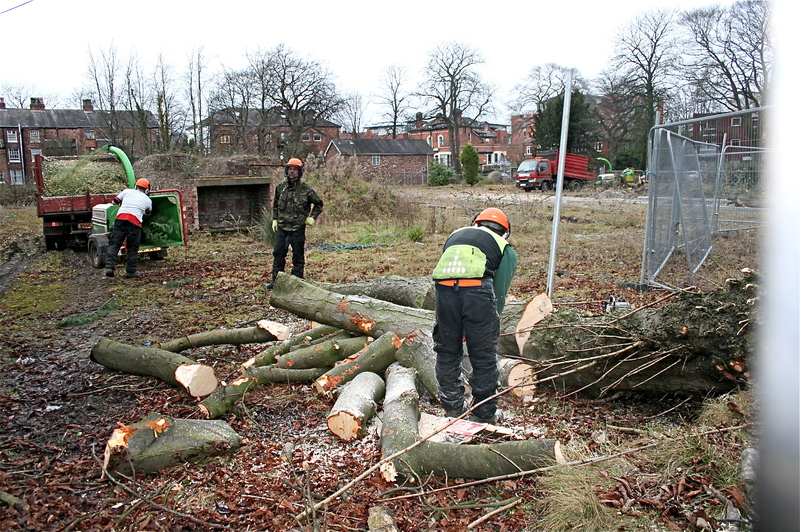 The old St John’s Ambulance site is was a plot filled with mature trees and wildlife but when the medics moved on, the site was bought by the Watkin Jones group. Having filmed at their developments in the past with Channel M, I though this was a good thing, they’d seemed like a nice bunch. The original development of apartments was scrapped for obvious reasons and currently planning permission is being sought for a development of 28 4 bedroomed town houses, apparently not aimed at students. Hmmm. Which families will buy a townhouse in the heart of Fallowfield next door to a pub with no amenity space factored in, no parking and tiny gardens….. The planners are considering an option that the houses can’t be rented out as HMO’s as they just won’t be suitable due to tiny rooms and undersized communal space but realistically, how enforceable will that be? So, please note, planning hasn’t been granted. No-one really knows what is going to be built on the site. 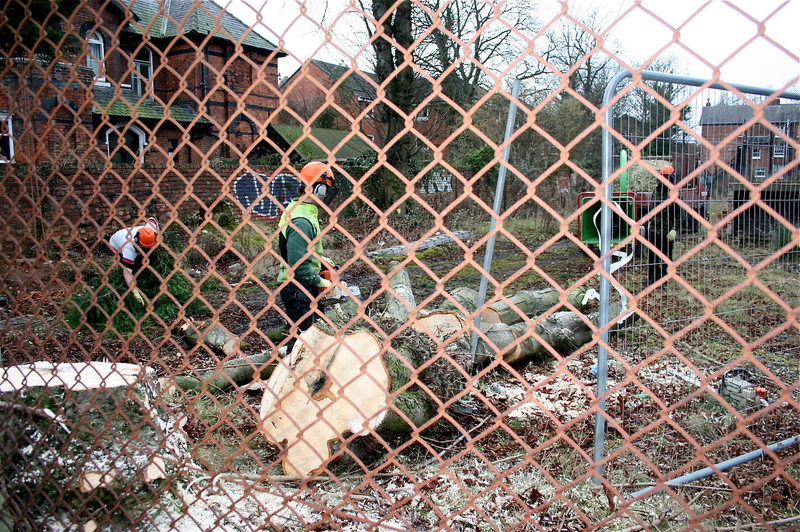 Horrific then, that this week Watkin Jones contracted workers who set about felling every single one of what was a site filled and surrounded by 16 mature trees and other less established trees too. 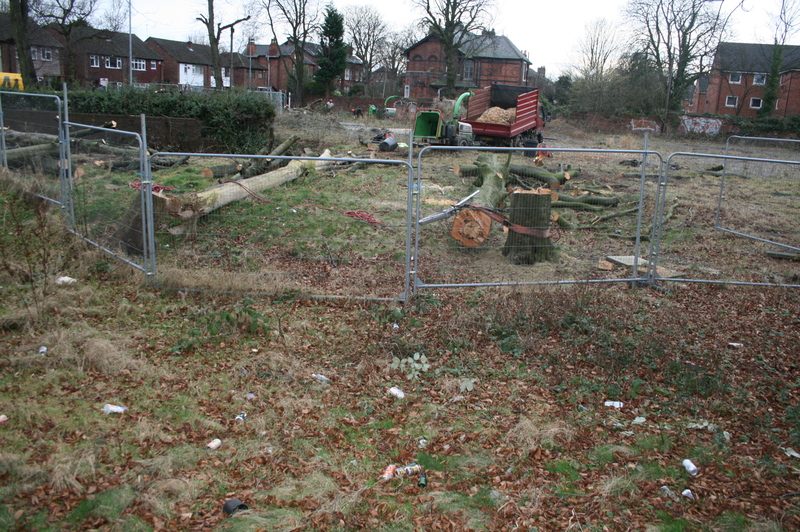 Despite the intervention of planning officers trying to negotiate the retention of some periferally sited trees, and a verbal assurance from Jason Berry, from Watkin Jones, given to both planners and local residents that he would visit the site and suspend the activity, no such visit took place and the destruction continued. 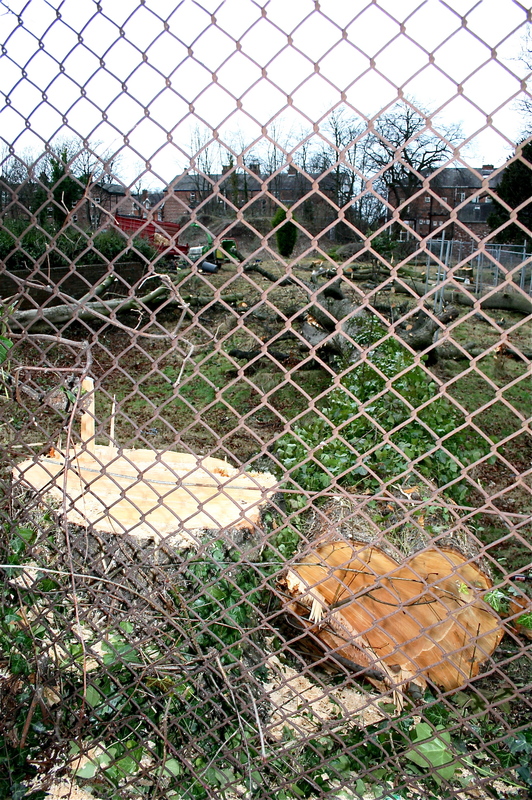 Indeed, in an act of pure vandalism, one operator, angered by the presence and arguments of planners, residents and one councillor, took his chainsaw and successfully ‘ringed’ six more mature trees, designated for felling on the W.J. Plan (as yet unapproved) and still standing up til this week. 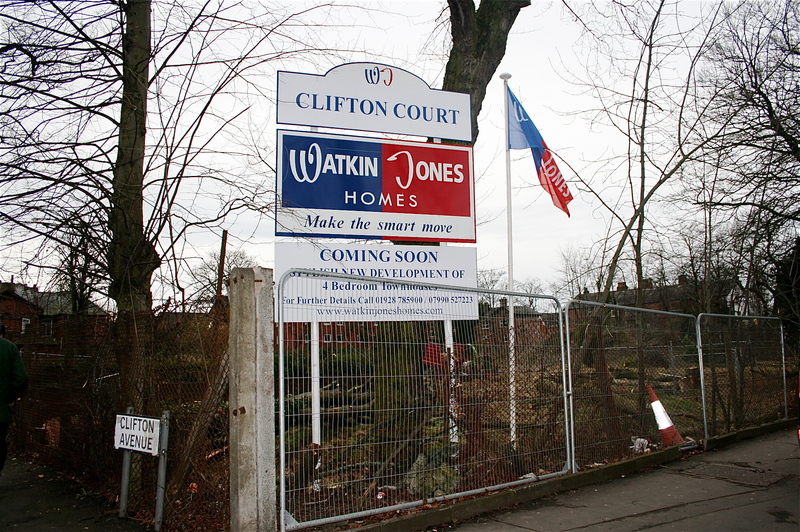 As a developer myself, though clearly not in the same league as Watkin Jones, I understand all about the financial viability of sites, I understand that times are hard and profits aren’t easy to come by and I understand that compromises have to be made. But this is just destruction for destruction’s sake before anything has been finalised, without any agreement. It’s getting rid of all the trees so if there is any debate about what can and can’t be built, it’s too late to bring the whole ‘mature trees’ argument in. What’s the betting they say it was a breakdown in communication and the top tier management didn’t know this was happening and are appalled?! 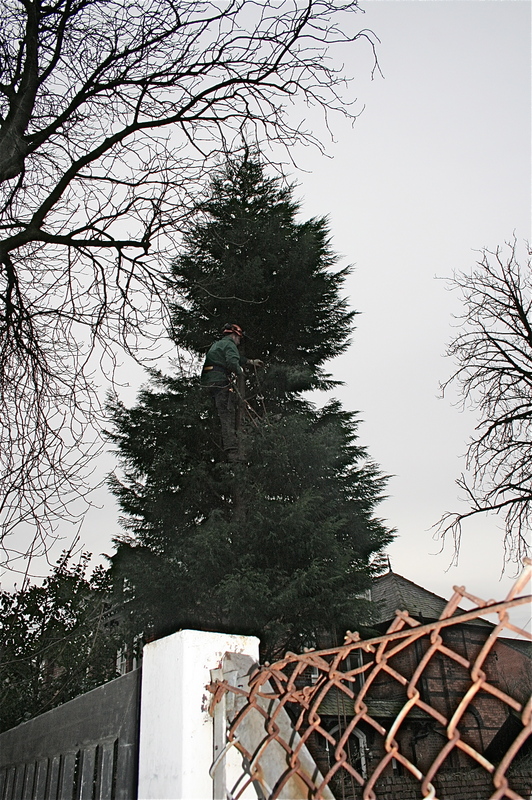 I just heard this afternoon that the council have put an emergency Tree Preservation Order on a yew tree on the site but that little else could be saved as it’s all been done very quickly and with no notification. We will also continue to recognise our responsibility to all stakeholders, including employees, customers, subcontractors, suppliers and communities which may be impacted, either positively or negatively, by our business activities. Watkin Jones are fully ISO 14001 accredited. We are committed to minimising the environmental impact of its development activities, and to promoting the philosophy of sustainable construction. And the best one is…. Watkin Jones also, wherever possible, employ local suppliers and contractors and specify locally sourced materials – thus reducing transport CO2 emissions. 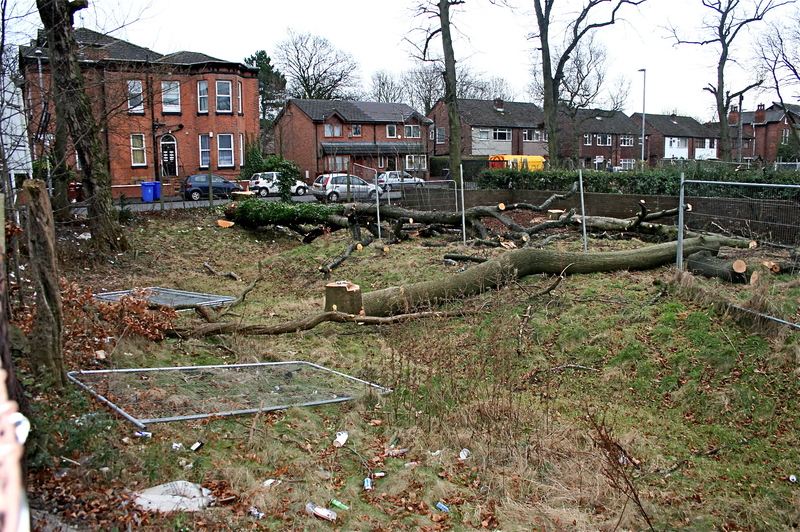 Mayve you wouldn’t have to worry so much about CO2 emissions if you left some trees standing, eh, Watkin Jones? It will be very sad walking past this site now it’s almost completely bare, a crying shame. I can’t wait ’til it’s filled with some red brick town house monstrosities though, that’ll be so much nicer…..
#Hemlinegate on Property Twitter – a storm in a D cup? Many congratulations to Watkins Jones (WJ) for a masterclass in how to win friends and influence people. The PR team at WJ must be really pleased with this story. I bet this story doesn’t get any coverage over in Wales from where they originate. It will be interesting to see if WJ even bother to implement a damage limitation campaign. They obviously think they are above any sort of ruling from Manchester City Council’s Planning Office. But hey why should they care? The arrogance of the company is breathtaking. Can’t imagine any of the directors of WJ live in the type of properties/development that are being imposed on the community of Fallowfield. The words Cowboy Builders comes to mind when thinking of WJ. A bunch of savages would perhaps be a better description. 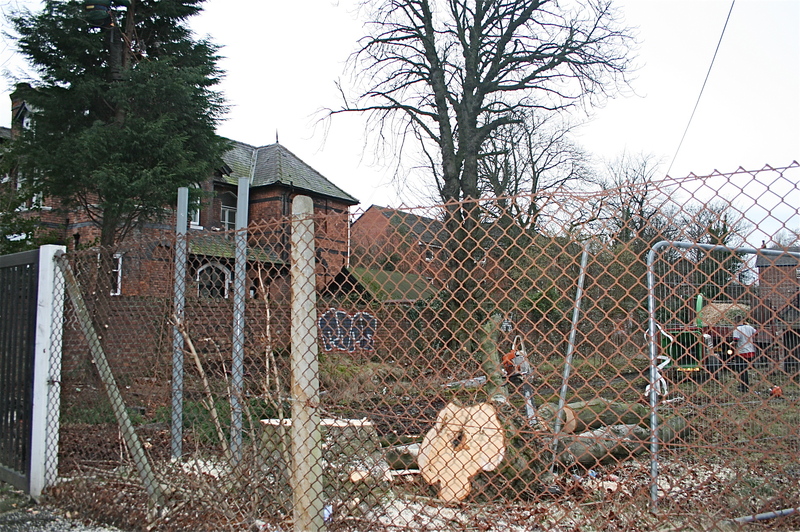 Why didn’t MCC act correctly in placing a provisional Tree Preservation Order on the whole site which could be modified when planning consent was granted? a token TPO on a couple of trees amounts to locking the stable door well after you know the horse has bolted. 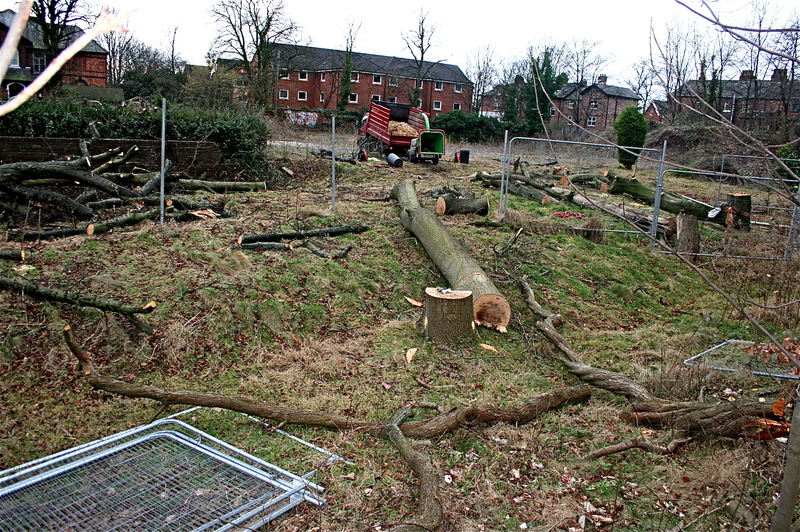 The tree felling at St John’s ambulance site in Fallowfield is an utter disgrace. its not your dads land…theyve bought it so whats it to you…so shat app.. I am a developer Rony, but have never decimated land, buildings or wildlife to make a profit. Nor did I ever simply stick paint on and make a profit. Your comment has a whiff of the ‘chip on shoulder’ about it….. I myself am in the building game, and live local to the WJ family and to be honest I am disappointed with the firm’s methodology in a site pre-start plan. The prep of the site was clearly marked ‘asap’ so that accurate surveys could be done and thus meant everything within to be cleared. During these difficult times, and with cost of building a house rising; losing a house on a scheme can drastically affect the end profits and as such saving a few trees instead may cost the whole developments viability. The implementation of bat boxes and refuge on one of my projects in the past meant that I had to sell up prior to any groundworks taking place. I agree with the view of a ‘savage attack’ on this site and that their approach was rather vicious. I hope the MD will be made aware of the company’s lapse in their eco credentials. That’s one persons biased opinion…..ridiculous argument from do gooder. No doubt the same idiot resdents who push there weight around, phone the council within 5 seconds of a drop of paper on the floor….oh sorry one of them is a councillor. a conflict of interest perhaps? Maybe if he/she hadn’t greed to change bin collections to 2 weekly there wouldn’t be such a mess.